Inside Self-Storage Store. Improving Your Self-Storage Collections: Effective Skills to Get the Rent! 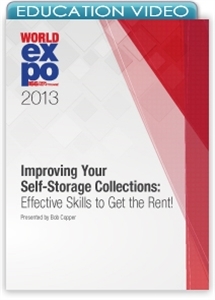 Improving Your Self-Storage Collections: Effective Skills to Get the Rent! Learn how to effectively manage accounts receivable through proven techniques that reduce past-due rent and your facility's number of lien auctions, all while increasing self-storage revenue. While no one was likely born to collect money, any self-storage operator can learn to effectively manage his accounts receivable by using proven techniques to reduce past-due amounts, uncollected rent and the facility's number of lien auctions. Our presenter will teach you skills that will have an immediate positive and lasting impact on your self-storage operation including methods guaranteed to increase revenue and reduce your collections headaches.